Dead Again by Masha Gessen. I got this book as part of a relatively new interest in the Russian intelligentsia. I had always been a little interested in non-conformist art and read the first volume of The Gulag Archipelago (as well as several other Solzhenitzsyn books) in high school. But it was picking up The Whisperers and Natasha's Dance by Orlando Figes that really got me interested. The tragic history of the great artists and poets who were suppressed by Stalin is perversely attractive. I will readily admit that an interest in oppressed artists is fundamentally adolescent. And indeed, for me it is also interesting to learn about the accommodations that artists made. You can see the same journey in Orlando Figes--Natasha's Dance, when it deals with the artists under communism, deals only with the tragic, oppressed artists. But in The Whisperers, Figes deals at length with the complicated case of Konstantin Simonov, an insider, an official artist, but a liberal who tried to push things in a freer direction. Zhivago's Children was just as fascinating. The Thaw and subsequent "re-freezing" that lead to the human rights movement in Russia is a fascinating period. As large and dense as Zhivago's Children is, it seems like the surface is only scratched there. But what happened during Perestroika and after the fall of the Soviet Union to all these artists, poets, scientists, activists, etc? Masha Gessen's Dead Again provides a sketch. Her book was published in 1997, so there hadn't been much time for the post Soviet Union intelligentsia to shake out. She is a breezy writer who comes out of a journalistic background, so she doesn't really feel the need to develop a thesis like Vladislav Zubok, an academic historian, did in Zhivago's Children. Indeed, both Figes and Zubok are historians, writing about the past. Geesen is a journalist writing about contemporary events. The difference in style and substance is captured by the difference between those two professions. 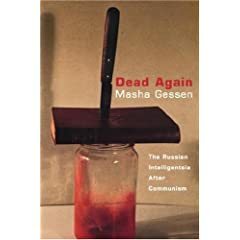 The main thing Geesen writes about is how the intelligentsia, who were a united front during the late Soviet period, collapsed into squabbling factions--which they had been prior to communism. You had one one hand the Western liberalizers, the Sakharovs and Bonners, and on the other hand, the nationalist/orthodox thinkers like Solzhenitsyn and Igor Shafarevich. This difference existed in Czarist times--the Slavophiles versus the Westernizers. This time around, the ultranationists anti-semitic right had a certain advantage--namely, the last time the Westernizers won a decisive victory, they brought with them the Western philosophies of socialism and dialectical materialism. Westernizing had been a tragedy for Russia. On the other hand, capitalism and democracy obviously worked out petty well in the West, so why not try it in Russia? Gessen deals also with the dissident intelligentsia who were suddenly thrust into politics--and almost as quickly spit out. She addresses nascent Russian feminist thought. She deals with the younger generation of Russian intellectuals, making a labored analogy with the characters in the Douglas Copeland book, Generation X. And she talks about the old human rights campaigners going into Chechnya--a war that had just ended (but would soon restart). Since then, it seems (to a casual outside observer) that things have gotten worse for the intelligentsia. One thinks of the brutal murders of Anna Politkovskaya and Natalia Estemirova (and of many others) and the impunity with which these crimes are committed. At the same time, one thinks of young geniuses who put their brains to work engaging in criminal computer hacking schemes. But I know that when I read these accounts, I am getting a narrow and highly biased account of the intelligentsia. I'd be interested in a more complete picture.